Properties in Ashford Station average 4.2 out of 5 stars. Our house is furnished as a home, in an English country house style. Property 4: Our house is furnished as a home, in an English country house style. SALE! Mindblowingly Stylish Kensington Mews House w/Terrace in Heart of it All! Property 36: SALE! Mindblowingly Stylish Kensington Mews House w/Terrace in Heart of it All! The charming cottage was more than we had expected: very spacious and nicely furnished, with little touches like fresh flowers. Easily accessible to all London has to offer, the house is situated near a small commercial area with shops (including grocery) and restaurants. The nearby bus line also takes you to delightful Richmond-Upon-Thames, where there's abundant shopping, dining and a great old theater that always has something interesting playing. Ellie was easy to deal with and very accommodating. Many thanks for helping to make our stay (our honeymoon, really) memorable. This Victorian Mews house jus off Hig St, Kensington offered everything 5 adults need to make our stay extremely enjoyable. 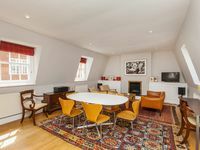 The facilities and comfort of the Mews style house were only matched by the excellent location that is minutes from the Tube, local bus services, restaurants and supermarkets. The ability to drop our bags off early enabled us to make the most of the day on our arrival. When we return to London we will have no hesitation in trying to stay here again.